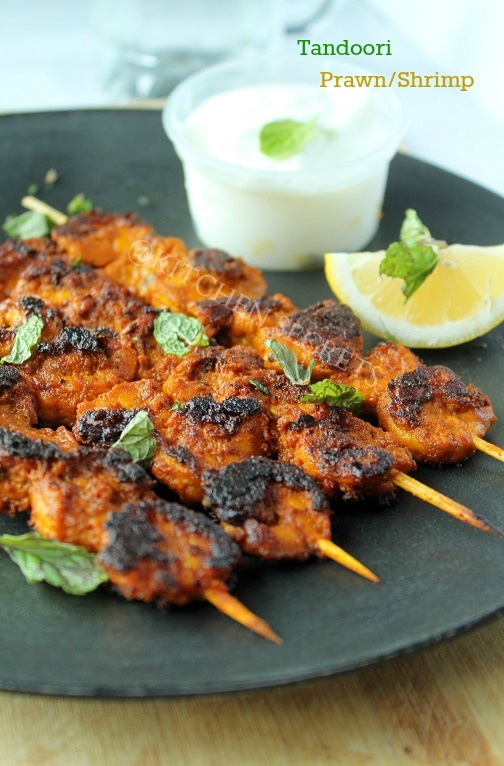 Tandoori is such an easy item to make at home, of course with grill or dosa pan. 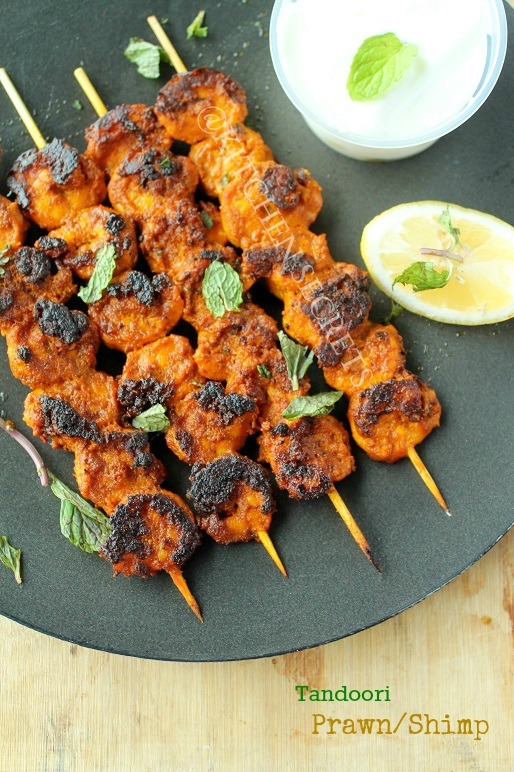 It can't get easier than this, just mix the masala with the prawns, marinate and then grill for 5 minutes top, that's it, tandoori prawn is done. This one is a great party pleaser and am sure everyone would love this one to the core. Take a look.. Mix the Besan flour and the cumin seeds with the oil and make a paste. Fry this paste until bubbly to get rid of the raw taste. Remove from the heat and reserve for later use. 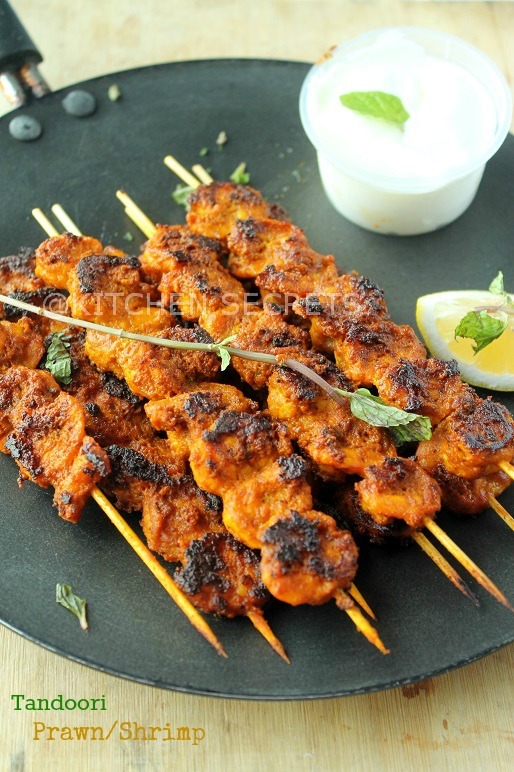 Soak the skewers over night in the water or at least put them in water until it is put to use. 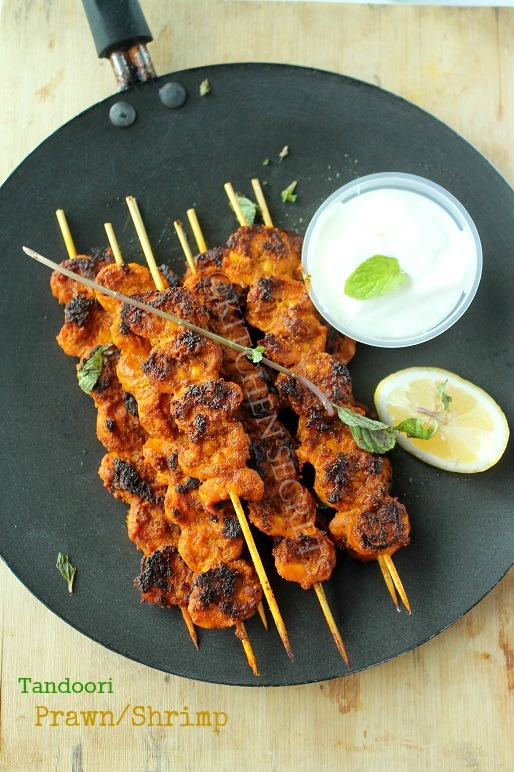 Mix the turmeric powder, red chilly powder, coriander powder, cumin powder, orange colour powder, yoghurt, lemon juice, ginger garlic paste, tandoori masala powder, garam masala powder, salt and make a thick paste. Now add the fried besan flour mixture to this and combine well and form a thick paste. Add the cleaned and deveined prawns to this masala mixture and combine so that all the masala gets evenly coated with the prawns. Refrigerate overnight or keep the marinated prawns inside the freezer for at least 2 hours. Heat a tawa/ dosa pan/ grill over high flame with little bit of oil sprinkled on top. 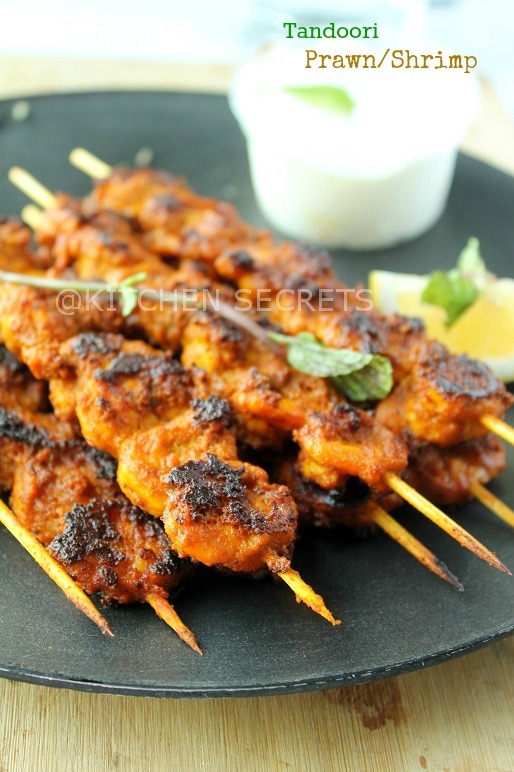 Take a soaked wooden skewer and slowly insert thread the prawns one by one. Brush it up with enough oil and grill it on the hot tawa for 2 minutes , then flip them to the other side, brush them with oil and cook for 2 more minutes or until done. Repeat the same process for the remaining prawns. 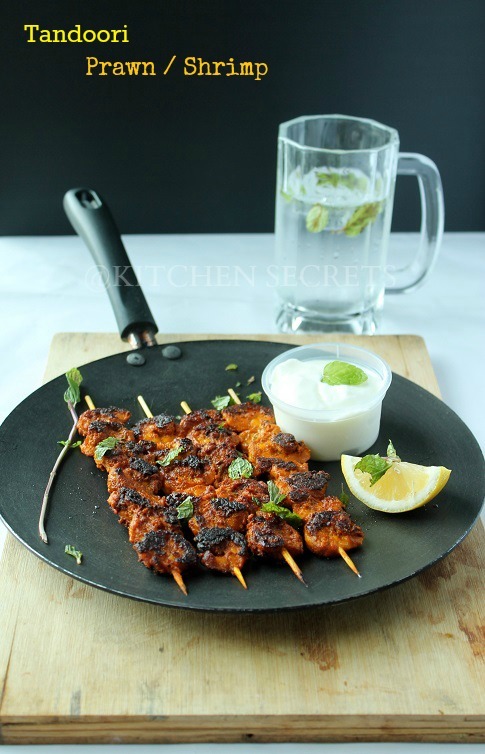 Serve hot with yogurt , mint dip, or simply with cucumber and lemon wedges. 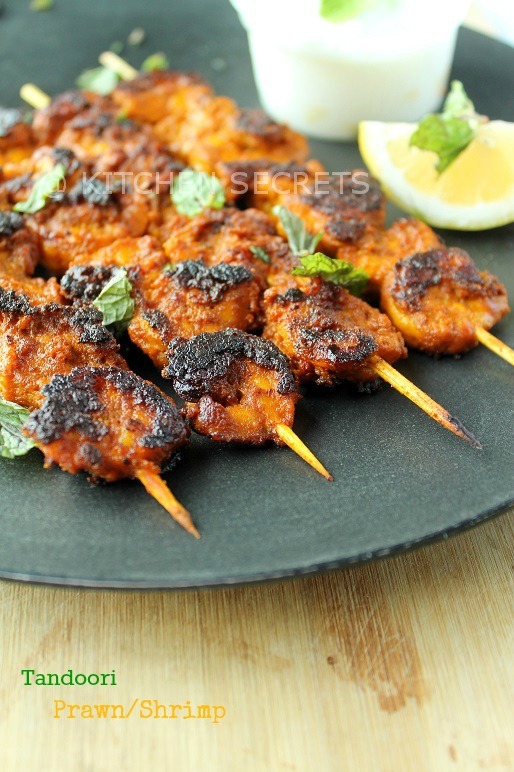 Adding fried besan flour mixture gives a slight coating as well as helps to hold the masala intact with the prawn. Got this tip from Saras of sarasyummybites.com Also don't add too much else it would not taste good and would end like prawn bajji. Don't overcook the prawn, just 5 minutes is enough. Till now i never tasted the prawns...hubby loves it very much,it looks wonderful dear!! Delicious and mouthwatering prawns. Excellent preparation. Beautiful clicks and well presented. Looks so delicious. superb presentation :) i love prawns.. will surely try this..
Omg, i dont bother to inviting myself to ur place, wat a stunning and super droolworth tandoori prawns. Bookmarking this,too good.i am in love with your tawa.